In the Small World category, the team leader of the 2011 Green Flight Challenge winning team is designing the next generation of a drone that can carry blood and stool samples from remote and otherwise inaccessible parts of Madagascar to a central laboratory where the samples can be analyzed. Jack Langelaan, Professor of Aerospace Engineering at Pennsylvania State University, is working with Vayu Aircraft to develop a vertical takeoff and landing machine specially crafted to meet the needs of the ValBio Centre. To ensure the drone making the deliveries does not cause operator injury, ducted fans provide lift for takeoffs and landings. The fans embedded in the wing have a mechanically-actuated door on top and passively-activated louvers on the lower surface to protect people working around them. An additional pair of ducted fans on the trailing edge sit on detachable struts “that aid in convenient transport and vehicle handling.” They can rotate up to 110 degrees in one axis. Although they assist in takeoffs and landings, their primary function is to provide thrust for forward flight. You can see the operation of the fans, covers and louvers in this short video. Batteries can provide 60 to 120 minutes endurance and a range up to 60 kilometers’ (37.2 miles’) range with a full payload. That payload can be up to 2.2 kilograms (4.84 pounds) and sits on the aircraft’s center of gravity. Besides medical samples, the nine liter payload bay can accommodate cameras and sensors with connections to onboard power and a data port that can connect the payload with the aircraft’s avionics. 80-percent lightweight carbon fiber construction makes the sizable payload possible. 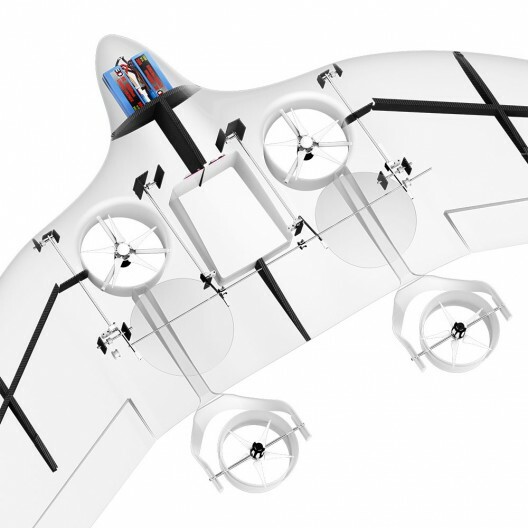 One advantage Vayu claims for its VTOL craft is that it does not need to be hand launched like some drones, and that the Courier UAV can land itself, using its “high-resolution optical tracking system and GPS” to set down in a parking space-sized area. To lower costs, Courier UAV™ mixes custom software, an open-source codebase, and off-the-shelf motors and servos. This enables others to work with the base machine and customize to suit different applications and environments. Because Courier is battery powered, no fumes from fossil fuels can contaminate samples or medicines delivered by this clean flight vehicle. 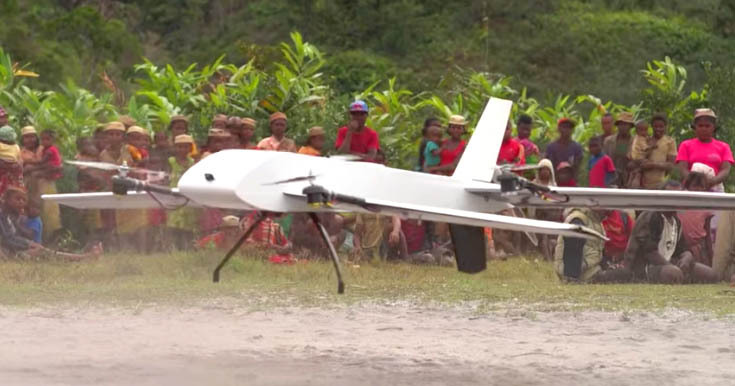 Wings, fans, motors, landing gear, batteries and payload are all removable, and the dismantled airframe can be carried on small trucks, trailers, or even on horseback, making the aircraft usable in even the most isolated areas. Stonybrook’s research station, the Centre ValBio at NamanaBe Hall on the borders of Ranomafana National Park, is a modern, green building with three laboratories and lodgings for up to 52 visiting scholars. 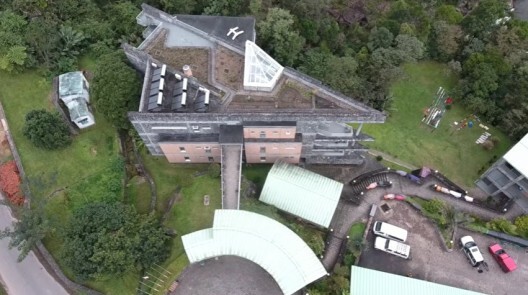 A triangular roof jutting out from the building seems ideally suited for aerial visits by drone. Centre ValBio works with a wide variety of researchers, including Patricia Wright, whose 28-years of research and advocacy for the island’s lemurs is portrayed in a recent IMAX film. Even the film-makers might want a drone for future efforts.